Russian cosmonaut Gennady Padalka (center), Expedition 32 commander; along with NASA astronaut Joe Acaba (left) and Russian cosmonaut Sergei Revin, both flight engineers, attired in Russian Sokol launch and entry suits, conduct a standard suit leak check in the Soyuz 30 (TMA-04M) spacecraft in preparation for their return to Earth scheduled for Sept. 16, 2012. Three astronauts are preparing to leave the International Space Station tonight (Sept. 16), returning to Earth after a four-month stay aboard the huge orbiting lab. A Soyuz spacecraft carrying NASA astronaut Joe Acaba and Russian cosmonauts Gennady Padalka and Sergei Revin is slated to undock from the space station at 7:09 p.m. EDT (2309 GMT) tonight and land in the steppes of Kazakhstan nearly four hours later, at 10:53 p.m. EDT (0253 GMT Monday). The astronauts' departure will bring the space station's Expedition 32 to a close. Padalka commands the expedition, while Acaba and Revin serve as flight engineers. Padalka will hand the orbiting lab's reins over to NASA's Sunita Williams, commander of the new Expedition 33. Expedition 33 will be a three-person operation for about a month. Williams, Russian cosmonaut Yuri Malenchenko and Japanese spaceflyer Akihiko Hoshide will have the station to themselves until mid-October, when the arrival of three new astronauts will bring the $100 billion orbiting complex back up to its full complement of six crewmates. Acaba, Padalka and Revin launched toward the station on May 14 and arrived three days later. They were originally scheduled to blast off in late March, but a botched pressure test cracked their Soyuz capsule, forcing a six-week delay while a new spacecraft was prepared. The astronauts' four-month stint marked the first long-term stay aboard the orbiting lab for both Acaba and Revin. Padalka, however, had lived on the station for long durations during two previous missions. 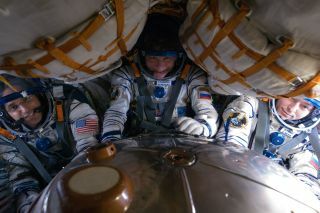 Acaba, Padalka and Revin got to be part of history shortly after they first floated through the space station's hatch. They were there to welcome SpaceX's robotic Dragon capsule, which on May 25 became the first private spacecraft ever to visit the 430-ton orbiting complex. Dragon's historic flight was a demonstration mission, to see if the capsule and SpaceX's Falcon 9 rocket are ready to begin a series of 12 contracted supply runs to the station for NASA. Everything went well, and the first of these bona fide cargo missions is likely to blast off next month.